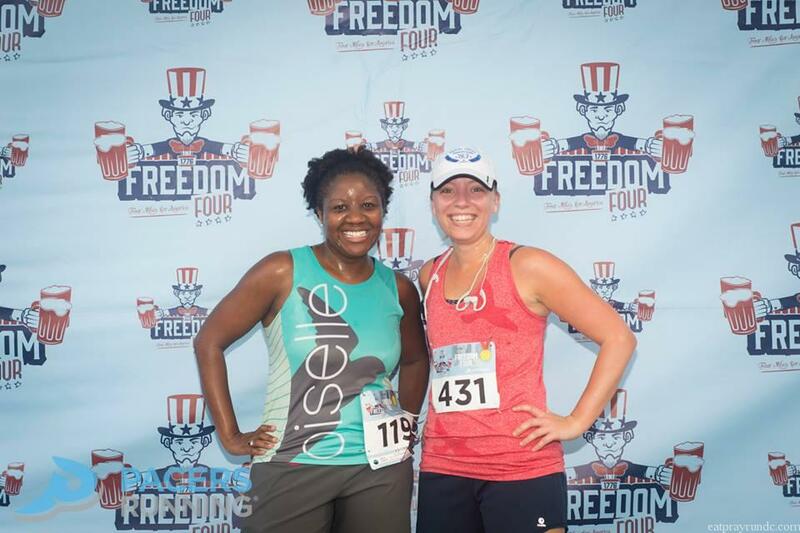 A few weekends ago, I ran Pacers’ Freedom Four Miler. I planned to use this race as my speedwork for the week and the race took place the day after a rainy 11 mile long run, so I did manage my expectations. Going into the race, I wanted to run an average pace around 9:20. Spoiler alert: that did NOT happen. Real talk, this recap could just be called “A Lesson in How NOT to Race” and that would be an accurate description. But I’ll give y’all a bit more info than that. 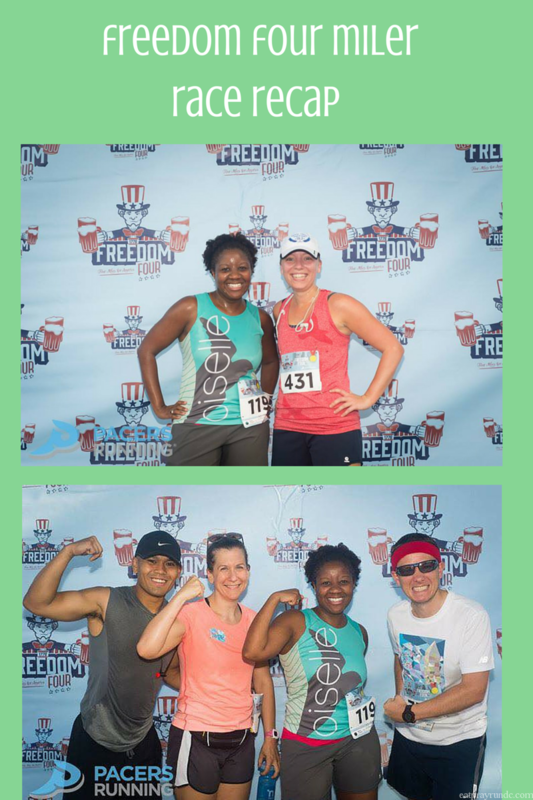 Before the race, I met up with a couple of my marathon training group buddies for some photo opps. They are all much faster than I am so I made plans to see them post race. This particular race starts with a one mile downhill before flattening out for a mile before the turnaround. Of course that means that the last mile is a steady uphill. I stupidly thought that wouldn’t be a problem for me. HA! It was. I started out with a solid 8:52 pace on the downhill and settled into the low 9:xxs for miles two and three. I even ran into my Oiselle teammate Kathryn during mile two! And then the wheels came off. I’m not sure what happened, but basically I just was over it and kind of gave up. I walked up that hill probably three times. I can’t recall the last time I walked in a race that wasn’t a marathon and after walking the first time, I was really dispirited. It just sucked in terms of my mindset. My head clearly wasn’t in it and that was the most disappointing part. Yes, my legs were heavy, yes it was a tough hill (everyone around me was walking as well), but I don’t believe in excuses. I just kind of gave up on myself and that is disappointing. That last mile was almost two minutes slower than miles two and three. Yeah. I completely blew up in that race and it’s an experience I’d rather not repeat. So lessons learned? I need to focus more on being mentally strong. I worked on this a lot last year and clearly need to revisit that. On that end, I’ve been working on fast finishes on longer runs and am going to continue to work on my mental game. Sometimes you have a bad race – but you gotta move on. 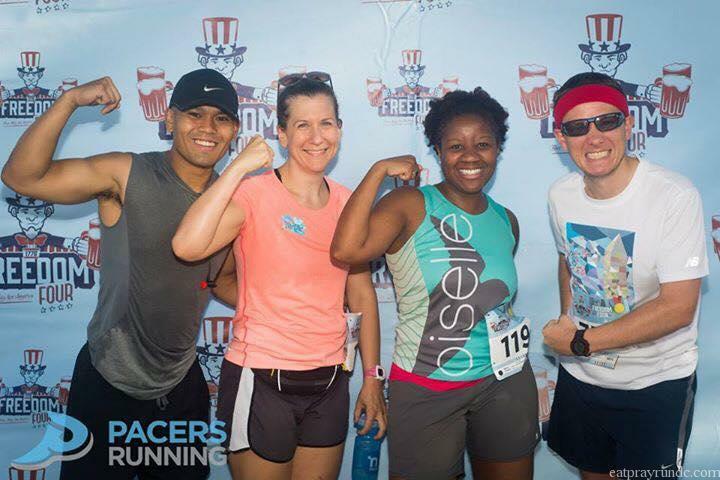 I’m over my disastrous finish in the Four Miler (which was otherwise a super fun race!) and ready to tackle the rest of my training. How do you react to a bad race? I think mental toughness is half the battle. Blowing up at races is never mentally enjoyable but it always teaches you something. I’ve had plenty of races I’ve taken far too fast. Bad races stink, at least in the moment; later on, when I’ve had a chance to think about it, I usually realize that they are like any other running day and that I can never know what to expect! That sounded like a tough race day and I think you did great, under the circumstances! You’ve got so many great races to come!!! I know that hill. I’ve run(?) that hill. There is no shame in walking that hill. The hard part about having a bad race is that it’s an event I have expectations for and if it goes badly, I can’t have it back! I’ve gotten better about feeling good about the effort I’ve put forth…if the outcome is bad but I know I gave my all, well that helps me move on. I’m a beginning runner and early this week I had a “bad” run. I ran about 15 min, but ended up walking(when I wanted to continue running back to my start point). After a few minutes, I thought, “You know what, you’re out here. You moved your body today.” Having a goal and not reaching it is better than having no goal at all. To quote Andy Mineo, “make moves or make excuses” and from my favorite running t-shirt, finishing=winning. Any day that I exercise my body is a good day and I thank God for blessing me to do so. Running is definitely just as much mental as it is physical. Just remember that we all have bad days of running, including races, and that in a couple of weeks you won’t even remember how this race went. I’m always surprised at how my mindset can affect my performance. we all have bad races and we all learn from them eventually. Its part of running. I think that a bad run makes me realize what I need to do better and where I need to improve. I know that this will just make you stronger and help you! Embrace the bad runs as well as the good ones! I’m sorry that was a hard race at the end. My last 2 10ks were like that, mostly because of the heat. Some days I feel like the mental part of running is harder than the physical part and it’s definitely a hard part to practice for in advance. Oh my gosh having a bad race is never fun, but there is always a lesson to be learned. Sounds like you’ve got the right attitude about it! Sometimes you are just not into it, especially in this weather. Happened to me at the 5K tonight. Don’t beat yourself up about it. Not every race can be a good one, and I think races like this definitely teach us where some of our weaknesses are and we can learn from them. But then again, some days we are just OFF, and that’s ok too! Don’t beat yourself up too much!